I am not a baker – I am a wanna be baker. I feel like I’ve got the cooking thing down, but baking is such a different animal. There’s too much science involved – you can’t just add a little of this or that; the measurements have to be exact. But nevertheless, I want to bake. Especially cupcakes – I love everything about cupcakes! I should also add that we found out a couple of months ago that my oldest son Brogan has tree nut allergies, so no more baked goods from a bakery (unless it’s a nut-free bakery). This means that anytime someone at his preschool brings baked goods for the class, his teacher lets me know and I send him in with his own. So I really need to figure this baking thing out. I will be experimenting through this blog. 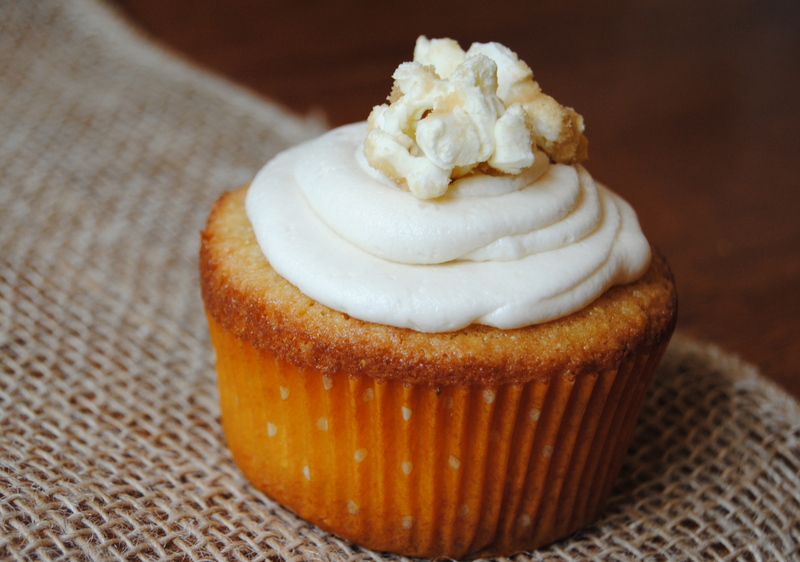 Some things will work (like these caramel corn cupcakes!!) and I’m sure some things won’t. I’ll spare you all the failures (unless they’re so bad it’s funny). Now on to these beauties I made yesterday… driving home from work last week I was trying to think of an original cupcake idea – something that I love in it’s natural state that would make a good cupcake. Caramel corn. I love caramel corn! I could eat myself sick with that stuff! 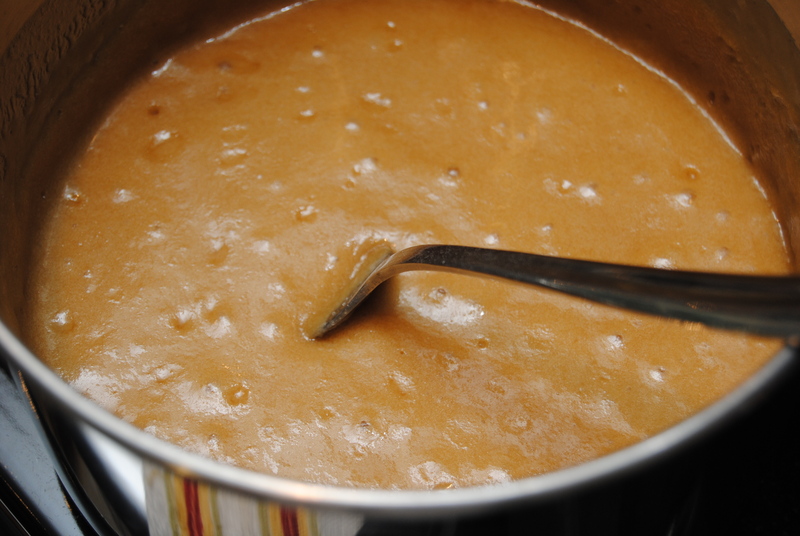 This had potential – incorporate a corn flavored cake with a caramel flavored frosting, delish! So I went to Pinterest and realized my original idea wasn’t so original. But I didn’t find exactly what I was after so I decided to get brave and modify. It got a little rocky when I was mixing the batter and it broke, but I got really, really lucky and the cupcakes were still amazing! Still not sure why it broke (I’m sure there is a scientific reason), but I guess no harm, no foul. 1.) Preheat oven to 350 degrees. Line cupcake tin with paper liners. 2.) Sift the flour, baking soda and salt together; set aside. 3.) In a food processor, puree the sour cream and corn. Set aside. 4.) Using a stand mixer with paddle attachment, cream butter, sugars and syrup together until light and fluffy, about 2 to 3 minutes. 5.) Add the eggs, one at a time, scraping down the bowl after each addition. 6.) Add the vanilla and sour cream/corn mixture and mix until fully combined. 7.) With the mixer on low speed, add the flour mixture in three additions, scraping down the sides between each addition. Do not over mix. 8.) Scoop batter using an ice cream scoop into cupcake liners until they are 3/4 full. Bake for 20-22 minutes. Cool completely before icing. 1.) Cream together butter, brown sugar and salt. 2.) Add powdered sugar slowly, scraping down sides as needed. 3.) Add vanilla and half and half 1 tbsp at a time until desired consistency is reached. I also got ambitious and made the caramel corn to go on top. 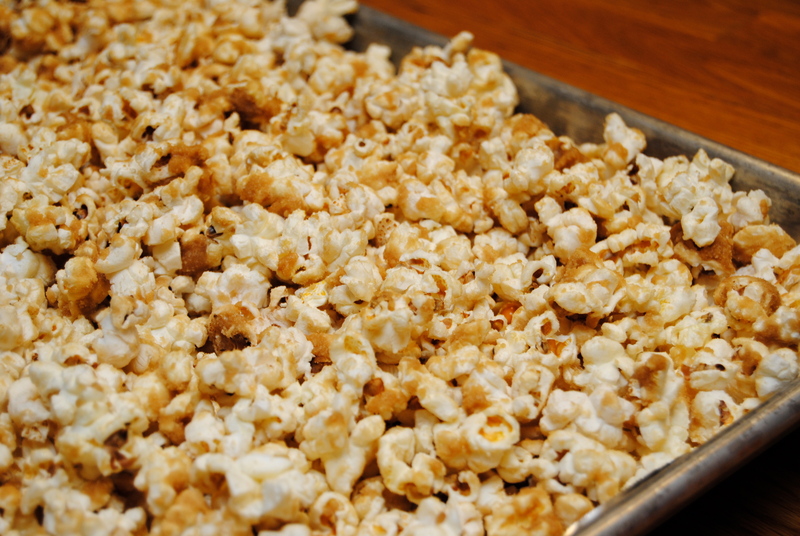 This didn’t turn out as great as I had hoped – I think I used too much popcorn, and I didn’t add the caramel sauce immediately (so it started to harden). The taste was fine, but it just didn’t get evenly distributed throughout all of the popcorn. 1.) Preheat oven to 250 degrees. 2.) Prepare popcorn and set aside. 3.) 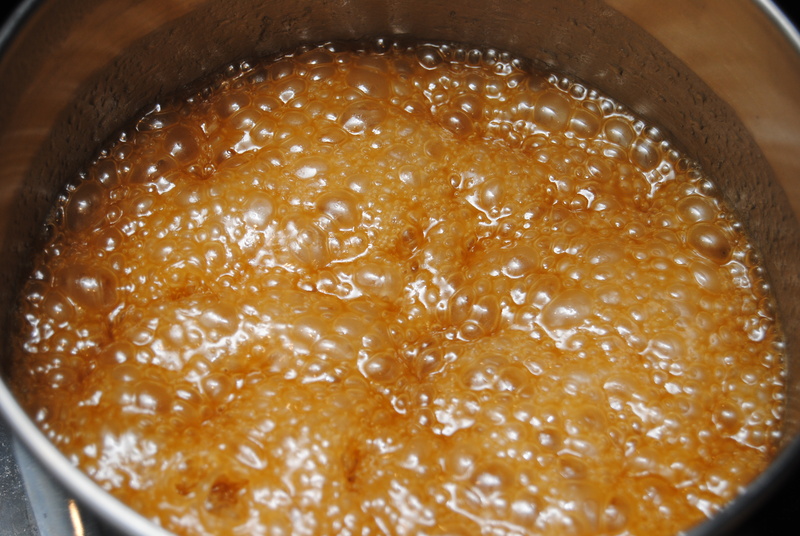 In a sauce pan, bring brown sugar, butter and syrup to a boil. Reduce heat and boil a slow boil for 5 minutes without stirring. 4.) Remove from heat and add baking soda, salt and vanilla. Stir well. Pour over popcorn immediately. 5.) Lay popcorn out on greased cookie sheets and bake for 1 hour, stirring every 20 minutes. 6.) Store in large ziplock bags. 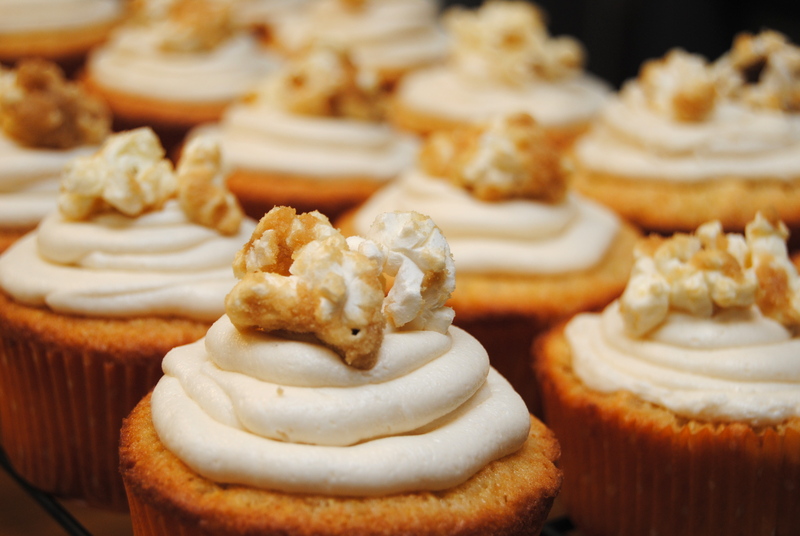 This entry was posted in Food and tagged Baking, Caramel, Caramel corn, Cupcake, Food, Maple syrup, Popcorn by biscuitsncrazy. Bookmark the permalink.